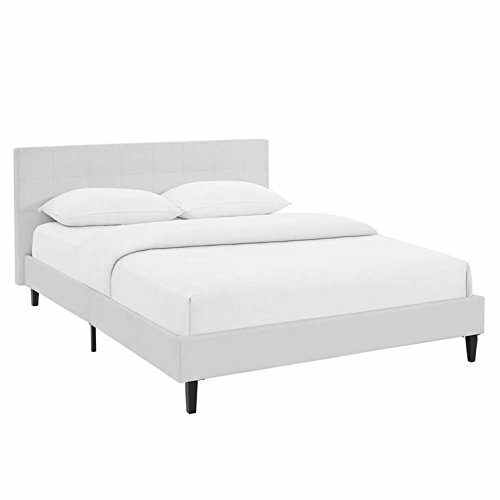 Inspire sweet dreams with the Linnea Platform Bed. Charmingly designed with grace and distinction, Linnea comes with a padded vinyl base, tufted faux leather headboard, solid wood legs, and a slatted wood support system that eliminates the need for a box spring. Complete with a reinforced center beam with supporting legs for maximal stability, Linnea accommodates the various mattress types on the market such as memory foam, spring, latex and hybrid. Imparting a heartening chic luxe look, Linnea is a well-made bed perfect for the instant update or bedroom transformation. Weight capacity up to 1300 lbs. Mattress Not Included.